A quick look at a dictionary tells us that understanding is ‘knowing what someone or something means’. This seems straightforward enough. However, understanding is a complex concept, which is often partial and rarely absolute. The degree and nature of understanding depends on a number of intricately interwoven factors. In everyday life, there is frequently no clear-cut distinction between ‘I understand’ and ‘I don’t understand’. A common pattern is for understanding to be minimal or limited at first, and to gradually grow and develop into something more complete over time. From a very young age, children have an instinctive desire to relate emotionally and socially to other people. They are also driven to construct understandings and make sense of the world around them. In order to do this, children use every clue they have at their disposal: what they can see, touch and hear in their immediate environment, their perception of the social context, their previous experience of human purposes and intentions, their affective relationship with immediate interlocutors, and the way language is used, including intonation and social interaction. When children start learning a foreign language, they bring to bear all this previous experience of finding or constructing meaning in order to make sense of the world around them. They also have a potentially similar desire to connect socially and emotionally with other people, and to communicate and share their understandings. As foreign language teachers, it is our responsibility to guide children towards constructing and creating joint understandings which allow them to find meaning, purpose and relevance in the language activities that we do in class. Through making meaning and language accessible, children are increasingly motivated to use the foreign language to express what they want to say. 1 Create a suitable context for learning – this needs to be natural, real and make sense to the child. It also needs to allow for the active discovery and construction of meaning, and lead to the use of language as a vehicle to do things which are relevant and purposeful. 2 Establish a caring working atmosphere – ensure that children feel safe and secure and know that you value their contributions and questions. Make sure they know it’s OK to ask if they don’t understand. 3 Use speech appropriate to children’s proficiency level – take a leaf out of the book of parents and carers and adapt the speech you use to make it comprehensible, especially to very young children. This may mean, for example, simplifying the syntax you use, using repetition and redundancy, and speaking at a slower pace. Be careful though that you don’t sound patronising or make children feel you’re treating them like babies! 4 Model processes and use think-aloud protocols – when setting up activities with the whole class, talk through out loud the cognitive processes and instructional procedures that children need to follow to do the activity successfully. This gives them a model to follow and may help them internalise language and understanding. 5 Provide adequate ‘wait time’ – when giving input or asking questions (see Q for Questioning techniques) remember to provide adequate ‘wait time’ (e.g. count to ten in your head) to allow children time to think of questions they would like to ask, or to assimilate your question and formulate a response. 6 Relate learning to personal experiences – whenever possible, provide opportunities for children to make connections between their understanding of lesson themes and their own personal experiences. This consolidates understanding and promotes ‘ownership’ of learning. 7 Encourage conversational interaction (negotiation of meaning) – make it clear that you would like children to comment, ask questions, express opinions in order to help them to process meaning. This may be in their first language, English or a mixture of the two, depending on language competence. Conversational interaction is important in fostering attentiveness and involvement as well as making sure meaning is accessible. 8 Provide appropriate scaffolding or support – be ready to provide a lot of initial scaffolding and support to establish understanding e.g. through the use of real objects, visuals, graphic organisers, mime and drama. Gradually withdraw support, or take down the scaffolding, as children show that they understand and are able to process meaning more independently. 9 Foster learning by doing – as the Chinese proverb goes, “I hear and I forget, I listen and I remember, I do and I understand”. Provide opportunities for children to apply their understanding in experiential learning activities as soon, and as frequently, as you can. 10 Provide opportunities to demonstrate understanding – a powerful way of fixing understanding in children’s minds is to provide them with plenty of opportunities to ‘show they know.’ This may be, for example, by giving a short presentation, creating a parallel version of a story or poem, or acting out a role play to the class. 11 Hand over knowledge and control to the children – very often, and perhaps without meaning to, we fall into the trap of limiting children’s understanding by stopping short of handing over knowledge and control, once children are ready to work more independently. This links directly to the next point. 12 Provide individualized opportunities to extend understanding – use a range of techniques and procedures to encourage children to develop personal interests, follow up with further investigation and take increasing responsibility for their own learning. Use this to enhance motivation and build up confidence and self-esteem. Any thoughts in the meanwhile? It’d be good to hear. Notes: this post draws on the writing of Margaret Donaldson Children’s Minds (1978) and Lynne Cameron Teaching Languages to Young Learners (2001). The dictionary referred to is Macmillan English Dictionary. The concept of ‘hand over’ is from Jerome Bruner. Thanks also to Antonia Clare who suggested I write about ‘U for Understanding’ on the IATEFL YLT SIG discussion list. 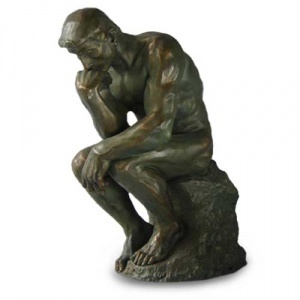 The sculpture is ‘Le penseur’ by Rodin. Great post, Carol. And thanks for the mention. Here is an interesting example of a teacher working on this in practice. Really worth watching the video to see how the T encourages the children, fostering learning and understanding. Many thanks Antonia. Yes, that is a wonderful video – really worth watching as you say. Love the way the teacher engages the children and uses everything in the immediate environment (visuals, eye contact, mime, gesture, voice etc) to create a context, focus on meaning and negotiate and build up the children’s understanding. I also love the extensive natural exposure to French from the teacher, the conversational interaction that keeps the children riveted and the way the children’s first language is a legitimate natural scaffold and bridge into French. The Chicken Pox song is also brilliant! Thanks again for sharing.